Ever see a tractor-trailer with a sleeper like this? Ever wonder what it was like inside? I can tell you, skoolie folks can take a few design lessons from these things. Standard sleepers are utilitarian and spartan, just sticking to the basics, but these extended ones are nicer than most apartments. The trade-off, of course, is the longer wheelbase makes for wider turning radius, but that already a given with a skoolie. These are a couple sites I found for companies that build these sleepers. Maybe it'll help give a few ideas for design and layout. I've been wanting a rig like that! most folks call em toterhomes. 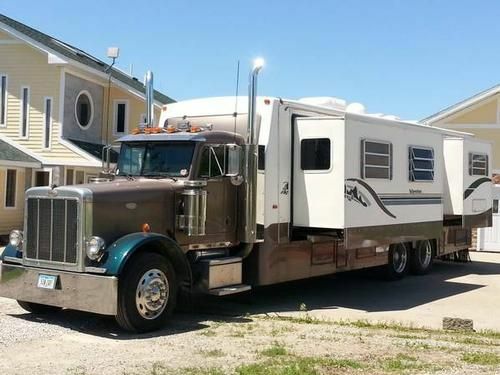 Maybe start with an 80's Pete... MMmmmmm I'd love to have a camper/cruiser with a 3406! But I wasn't saying so much in the realm of that particular type of vehicle, just in the efficiency of the space usage of the layout. It's half the length of the skoolie and has just as much space. Makes me think this level of thought in design and space usage could really make a skoolie feel like a mansion. I am getting more design ideas from business jets and high-end yachts than from the RV world. Most RVs are quite simply hideous, inside and out, and they have nothing of any interest to me. A beautiful Italian yacht or power cruiser, or some gorgeous Grumman Gulfstream, are what inspire me. Simple clean lines, fastidious attention to detail and an uncompromised aesthetic are my inspirations, not some god-awful POS plastic RV and its miserable interior. After all, isn't this why we're building our own motorhomes instead of just buying something? I am getting more design ideas from business jets and high-end yachts than from the RV world. Most RVs are quite simply hideous, inside and out, and they have nothing of any interest to me. Simple clean lines, fastidious attention to detail and an uncompromised aesthetic are my inspirations, not some god-awful POS plastic RV and its miserable interior. After all, isn't this why we're building our own motorhomes instead of just buying something? True, but these extended tractor sleepers aren't quite typical RV offerings. Take a look, you'll see. Besides, there's nothing wrong with taking a page from someone else if it works better. I think some of the spaces in the truck sleepers are neat, you just have to remember that you're compromising different things with them - for example, the height - the same reason some people do a roof raise - when you can go up, you can get a lot more bang for your buck with the same size floor plan, but now you have a taller rig - that may or may not fit in some places. The toterhomes with the trailers bolted on are still just trailers on a nicer frame - they won't hold up in a crash. A lot of people borrow from aviation or shipbuilding - they're used to constraints that even make a short bus look huge in comparison. The real question is where do you stick a bucket truck arm on one of those toterhomes. . . . . .